That isn't the North Node conjunct the Sun. Those are Edward's gigantic b@lls. 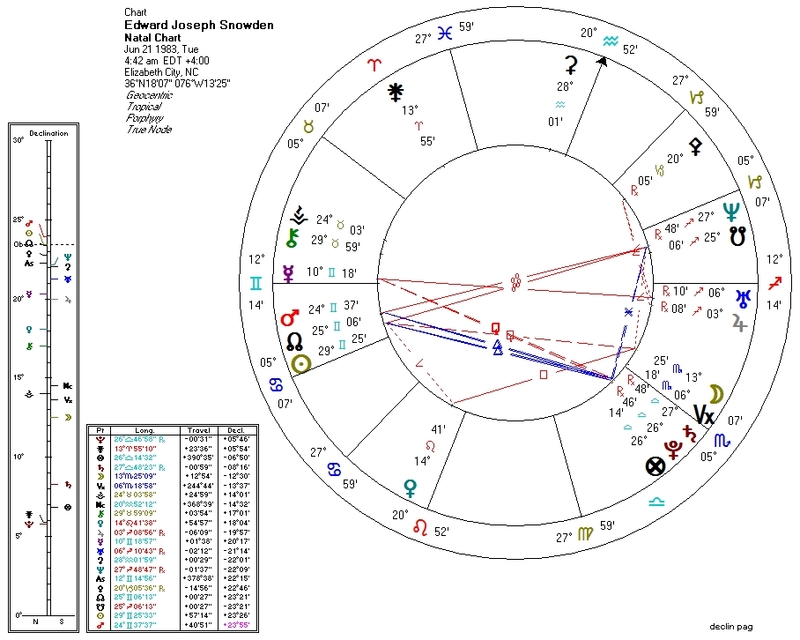 This is an astrological chart for Edward Snowden, the brave young man who revealed massive NSA spying operations on every single man, woman, and child in America. The chart pattern is typical of individuals who begin government/military careers and later experience a crisis of conscience which motivates them to side with humanity against the machine (Adam Kokesh and Smedley Butler, both in my research, come to mind). Such individuals nearly always have authoritarian Pallas-Pluto connections which then are weakened over time by configurations involving the lunar Nodes. On the authoritarian side (generally necessary for many government careers), Pluto is conjunct Saturn, ruler of Pallas. On the libertarian side, Saturn is trine Sun and sesquiquadrate Mercury; more importantly, declination shows a stunning Pallas/Sun/North-Node triple parallel. The North Node, with regard to Pallas, is typically much stronger than Pluto over time. This is man whose ethics may begin in a fog but eventually become brilliantly clear. Statistically, there are probably large numbers of these "sleeper agents for liberty" currently in the employ of the State Leviathan, unaware that they will eventually be compelled by conscience to turn against their master. A more standard reading of the chart might point out the Uranus-Jupiter conjunction opposite Mercury (liberation of information to the public, etc.). In my opinion, this is absolutely relevant to the outward expression of Snowden's heroism, but Pallas is the core of why he felt driven to it in the first place. The South Node conjunction to Neptune is also significant: the story broke during the recent Neptune retrograde station as well. Neptune, to a large degree, rules the State. That Snowden has Neptune on the South Node and the Sun on the North Node may indicate an impulse to turn away from that most impersonal, humanity-dissolving, and deceptive of institutions... into the light. If we all had the conviction and cojones of Mr. Snowden, the world would be a finer place.